There’s no denying that, and everyone knows it. Although people like to, dare we say, sugarcoat the issue and minimize the problem by saying they have a sweet tooth, consuming too much sugar can be gravely dangerous. In fact, research has linked high sugar consumption with obesity, Type 2 Diabetes, Heart Disease, Cancer, Alzheimer’s and tooth decay. However, despite the continual warning by health officials, sugar consumption has steadily increased each year in the United States. The latest numbers suggest Americans consume 11.18 million metric tons of sugar a year. That averages out to be approximately 126.4 grams of sugar per day per American citizen. Not only is that more than double the recommended daily intake, it also doubles the risk of death by heart disease. Men who drink two or more servings of sugary soft drinks a day are 69% more likely to develop gout. Too much sugar weakens the immune system. Specifically, 100g sugar reduces immune system efficiency by 40% for at least 5 hours. Not only will you be bouncing off the walls, sugar legitimately makes you age faster. Drinking 1 to 3 servings of a sugary beverage increases your risk of Type 2 Diabetes by at least 26%. People who suffer from Dementia AND high blood sugar have a much faster cognitive decline rate. Yikes! Those are some scary statistics. While sugar is bad for everyone, it is especially dangerous for vulnerable populations such as our elderly loved ones. 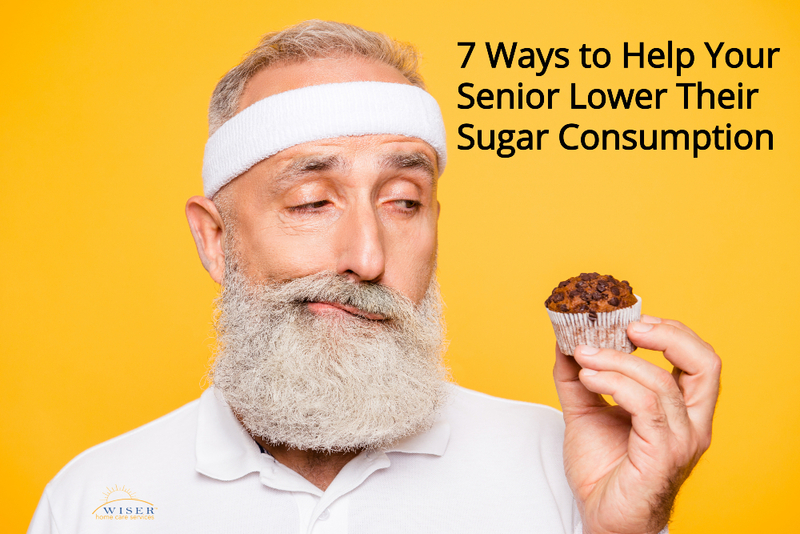 Fortunately, there are plenty of ways you can help your senior maintain a healthy sugar level while eating a delicious diet. Keep reading to learn 7 ways to do so. Soft drinks, alcohol, and fruit juices contain high amounts of sugar. By limiting consumption of these beverage to one or two a week, you can greatly reduce the amount of extra sugar your elderly loved one consumes. You can also try healthier alternatives such as sparkling water, lemon or cucumber water. For drinks that people typically add sugar to, such as coffee or tea, we recommend gradually reducing the amount of sugar they add to them. Tea, in and of itself, is a fairly healthy beverage option. It only loses that benefit when sugar is added in excess. There are a lot of foods that people consider ‘healthy’ that actually have very high sugar levels. These foods include yogurts, condiments, fruit juice, granola, tomato sauce, cereal, and canned fruit. We know you have a sweet tooth, but most desserts contain an ungodly amount of sugar. Instead try a healthy alternative such as fresh fruit, a little dark chocolate or Greek yogurt. Most condiments are filled to the brim with sugar and fat, which is why we recommend minimizing your elderly loved one’s use of them. Instead try pesto, mustard, fresh chili powder or any other fresh or dried herb/spice. You know that cache we’re talking about. Those candies and snacks you have high in the cupboard ‘just-in-case’ you get a craving. Studies show that even if you have great willpower, you are still more likely to choose sweets rather than healthy food if you have quick access to it. There will be times when the craving can become too great. In these times, it is imperative to have a distraction such as going for a walk, playing a board game or completing a puzzle. Doing so will help stave off the craving. We know it will be hard work, we even battle with sugar cravings too. But making sure your elderly loved one is healthy and safe is worth it. If you still have questions and concerns about how to help your elderly loved one maintain a healthy diet, please feel free to contact us. We can help your family establish a care plan to personally accommodate your loved one needs.